Traveling With Kids: Happy New Year! Happy new year from me and my family, to you and yours! I hope 2013 brings a lot of love, peace, and happiness for everyone. 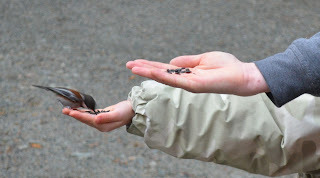 Feeding the birds in Stanley Park, Vancouver, with my kids yesterday. I'll be back with a lot more travel tips and stories in the new year!